Disclaimer: I'm an omnivore. There are few things I love as much as a tender filet or ribeye grilled to a perfect medium-rare. 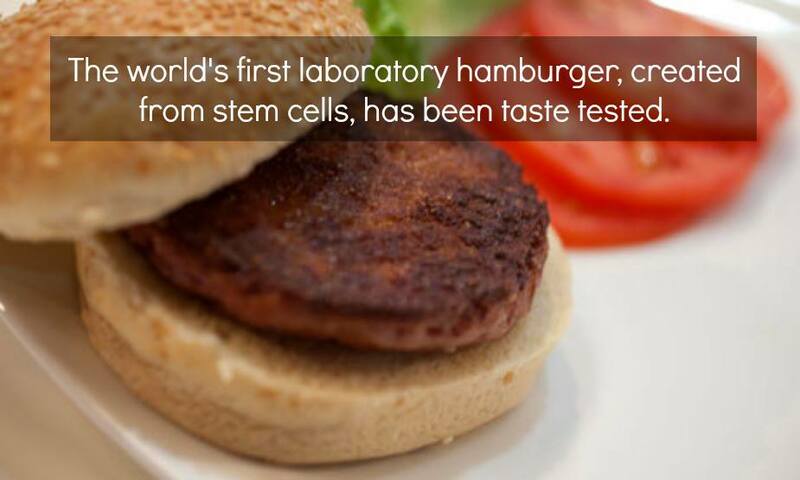 You may have caught the news: after $300,000 worth of research, scientists have created the world's first lab-grown burger and submitted it to taste testers. The verdict? Not bad, it seems. The texture of meat is there, but there was literally no fat whatsoever in the meat, which contributed to a lack of flavor; scientists, however, say that is an easy fix. Finally, meat that a vegan could eat. Except, given that vegans and vegetarians are such a small segment of the population, if this is going to be a viable product over the long-term, they're gonna have to make it appeal to meat-eaters. It's also going to have to be cheaper and easier to manufacture than cattle. So, while it's a nice idea and certainly uber-cool science, it'll be many years – maybe even decades – before anything like this is commonplace in our supermarkets. But clearly, the big boon to lab-created meat is the total lack of animal suffering. I'm a meat eater and an animal lover, which has certainly pushed me to consider veganism on more than one occasion given that I'm well aware of the abuses that animals suffer in our overcrowded factory farms. So why aren't I a vegetarian? Well, it's because I don't think there's anything wrong with eating animals. What I think is wrong is the environmentally unsustainable and frequently unethical practices of raising animals in factory farms. Factory farms can certainly give you a shock that might propel you toward giving up meat, but I think that the problem of factory farming is a fundamentally distinct issue from whether it's ethical to eat meat, and unfortunately that distinction is often lost in my conversations with my vegan friends. Back in olden times, animal farming was a mutually beneficial relationship. A cow would fertilize soil, keep pastures from overgrowing, provide milk, and then it was slaughtered for meat before the ravages of nature would take their toll. Say what you want about the sometimes messy slaughtering in factory farms – it's undeniable that we're much more efficient at killing things than nature is. A cow in a factory farm, most of the time, dies a quick and mostly painless death. In nature, a cow would die of exposure, disease, predation, or starvation. That's why I don't think that in principle, there is anything wrong with slaughtering an animal and using it for food (and whatever else). It's still possible to have that mutually beneficial relationship with animals, but factory farms do it wrong. However, we perpetuate factory farming through artificial means, such as corn and soy subsidies. Last year, there was a corn shortage due to drought. Produce prices didn't rise this year, but – as predicted – meat prices did. Livestock don't naturally feed on corn and soy, and those products have to be subsidized to sustain the low cost of producing meat through factory farms. If our government invested in sustainable farming instead, the factory farming model would eventually become obsolete. As a consumer, I think it's possible to have the meat without the guilt. You can purchase grass-fed beef and chicken that is certified by the Human Farm Animal Care. You can reduce your overall meat consumption (and let's face it – you need more veggies anyway) without eliminating it entirely. And, we can continue to advocate our local, state and national government to invest in sustainable agriculture.